Imagine the year is 1983. Your Dad has just hooked up the VCR to the cable but you can't record anything until you tune the VCR by setting all those pins in the back panel. Your remote for your TV has no numerals, just up and down volume and channel controls, but the remote for your VCR is some kind of Soviet space station panel of push buttons. That's how I felt when I saw the crazy "Qwerty-keyboard, dual-jog-shuttle" remote thing for Sony's version of their Google TV implementation. 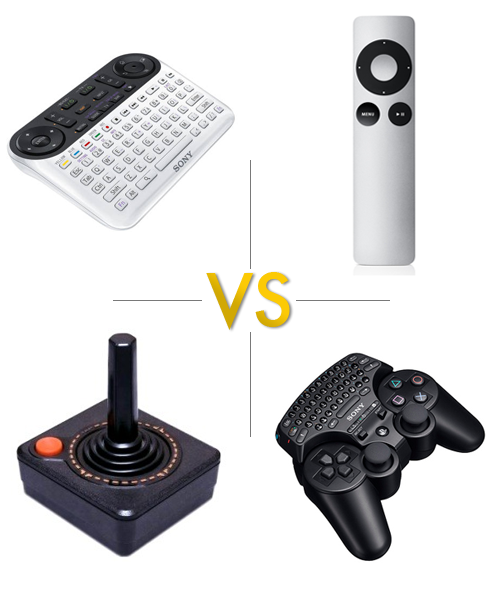 If I had my way, all remotes would be either like the Apple remote or the 1-button joystick of yore (except "accidentally" sitting on the joystick isn't nearly as fun as some might tell you). The funny thing is, Sony has mastered the remote arts with their game consoles yet decided to throw that knowledge away and start from well, what? 1983? Back to the Future versus Yesterday Tomorrow.